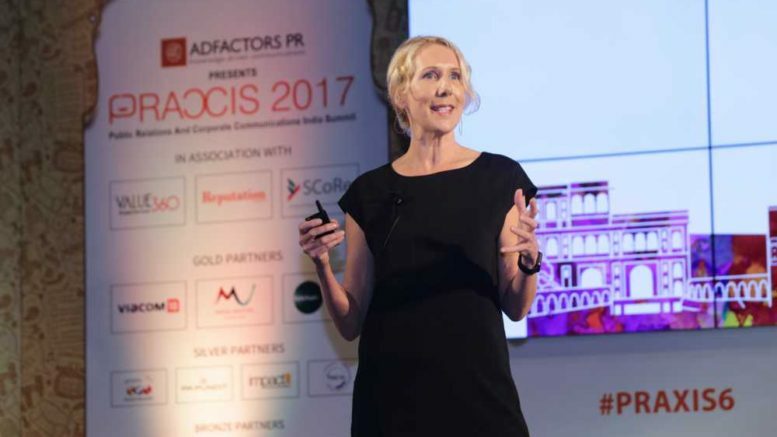 It’s all about how to look at brands in motion, said Jennifer Granston, Global COO, WE Communications on Communicating for Brands in Motion in her address at #PRAXIS6. The environment is accelerated now and there is disruption happening, and everything is moving faster. “Five years ago we were happy with taxis, then Uber came on; earlier we had to carry our phone and music separately, but now we have the smart phone!” she recalled. Unlike brand positioning, which assumes a static view of consumer perceptions, brand motion takes into account the influence of broader environmental factors and underlying consumer expectations. She spoke about the New Realities, which are a set of realities that emerged from the research that applies to every geography, every category and every brand surveyed, including India. The study done by WE exposes four realities that businesses, regardless of market and category, can harness for the mutual benefit of brands and stakeholders. Reality 1: Stability is an element of motion. Despite the rapid change facing consumers today, a high number of them believe brands are capable of providing stability in uncertain times – 79% of respondents in India said they believed brands can provide stability, with a staggering 94% of Indian consumers surveyed citing technology B2B brands specifically as having the ability to serve this role. This presents a significant opportunity for brands in India to step up and lead. Reality 2: Cutting edge is transcendent. Anything viewed as “cutting edge” tends to be more loved than hated, viewed as a pleasure versus a misery to do business with, and a benefit versus harm to society. Conversely, the data shows that anything viewed as being “stuck in the stone age” also has a higher chance of being “hated”, “a misery” and being viewed as doing harm to society. The research suggests that brands that can lean into their innovation story will get a lift in other areas of their business. Reality 3: The Unilever effect. In India, nearly half of surveyed consumers (48%) said they placed a balance on brands delivering not only highly effective, high-functional benefit products and services but also taking an active position on issues that provide long-term social value. Consumers increasingly expect brands to take a stand on important issues, and are not only looking for brands that provide a great product, but one that they feel aligns with their values too. Reality 4: Love you today, shame you tomorrow? Across all markets surveyed, there is evidence of low customer loyalty, where an average of 54% of respondents say they “love” versus “hate” a category, yet when asked if they would “shame” or “defend” a brand in this category if they step out of line, a staggering 98% would shame them. Higher than average defense of technology brands is present in India and China versus other markets surveyed. Additional data was gathered in India that looked specifically at consumer perceptions of the technology B2B category. 93% of Indian respondents said they generally love (versus hate) companies operating in this space, and 94% view them as cutting edge versus stuck in the stone age. This gives these brands, whether local companies or global brands operating in India, a wide berth to take more risks, knowing they have strong support from consumers. India also shows a positive climate for technology progress with over half of respondents agreeing that the policies, lawmakers and regulations of this market reinforce innovation. Be the first to comment on "Communicating for brands in motion"